CHAUVET DJ has taken wireless mobility to a new level with the introduction of the EZpin™ IRC battery powered LED pin spot. The groundbreaking new fixture leads a collection of exciting products that the company will be unveiling at NAMM 2014. Also included in this group of NAMM introductions are a versatile quad color LED wireless wash with zoom and an advanced water-based hazer. The new battery powered EZpin IRC will make it easier than ever for end-users to pin spot centerpieces and other focal points in any venue. Compact yet ruggedly built, the EZpin IRC has been designed to provide DJs, mobile entertainers and bands with an extremely versatile pin spotting solution. For example, the fixture’s innovative magnetic base makes it possible to affix the pin spot to most metal surfaces without using clamps. Adding to the versatility of the EZpin IRC is a scissor clip with an eye loop that allows the fixture to be attached to drop ceiling supports without requiring time-consuming cabling. 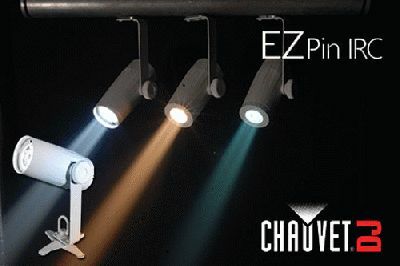 The EZPin IRC also makes it easy to create different looks to fit the mood of different occasions with a variety of gels that includes warm white, red, green, blue and yellow. For even greater mobility, the EZpin IRC can be operated wirelessly using the optional IRC-6 remote (sold separately). 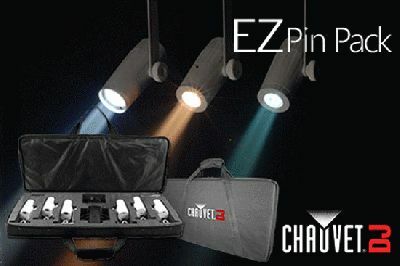 An EZpin Pack, which bundles 6 EZpin™ IRC fixtures and an IRC-6 remote with a VIP Gear Bag, is also available. 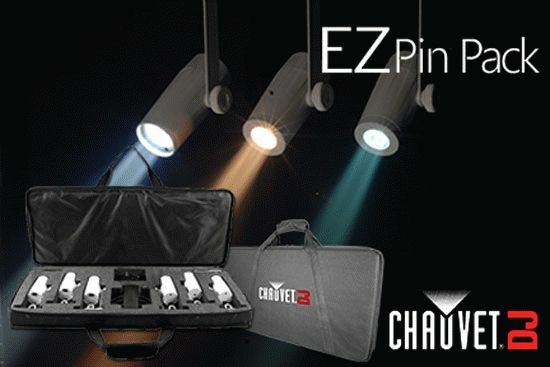 Aside from being an attractive starter pin-spotting package, the value-driven kit also provides a cost-efficient way for mobile entertainers to build their existing lighting rigs. 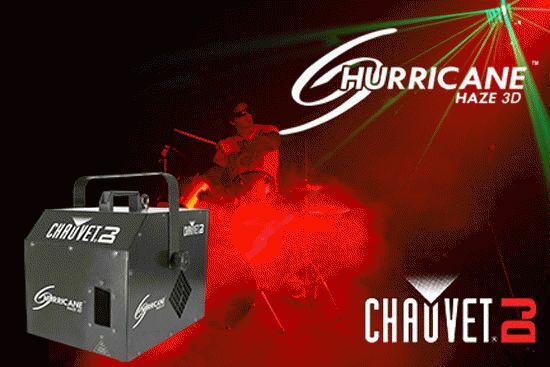 Joining the versatile EZpin IRC at the CHAUVET DJ NAMM booth is the equally adept new Intimidator™ Wash Zoom 250 IRC. This feature-rich compact moving head wash fixture is fitted with 20-watt quad-color RGBW LEDs and includes manual zoom for short-throw or long-throw applications. The Wash Zoom 250 IRC also offers wireless non-DMX control using the optional IRC-6 remote as well as built-in auto programs with sectional control. 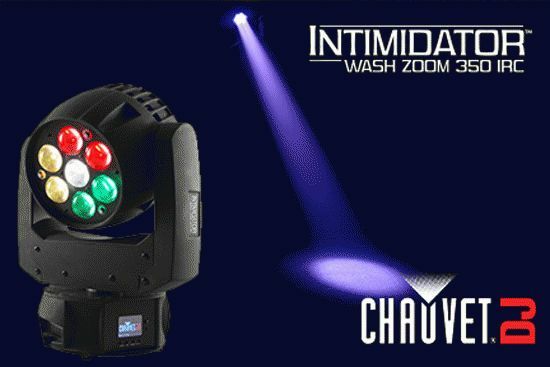 The Intimidator™ Wash Zoom 350 IRC is a new moving head wash fixture that also features 20-watt quad color LEDs and IRC remote control capabilities. The Intimidator™ Wash Zoom 350 IRC also includes motorized zoom control for short or long throw applications and built-in, eye-catching auto programs with sectional control. Another newcomer is the Hurricane™ Haze 3D, a water-based haze machine. Building on the outstanding performance features of its predecessor the Hurricane™ Haze 2D, the new haze machine delivers a higher output of subtle atmosphere with less heat up time. The unit’s new and improved silent running fan makes it ideal for applications where sound is an issue. Other features offered by the Hurricane Haze 3D include an automatic shut off when the tank is empty. It’s built-in digital display that quickly and easily sets DMX functions and haze and fan stand-alone settings.